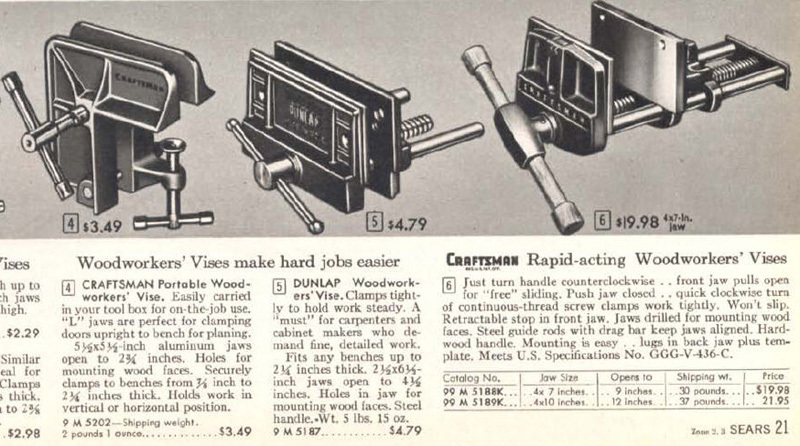 In the 1960s, Columbian was providing Craftsman with 7″ and 10″ woodworker’s vise models. The 10″, model no. 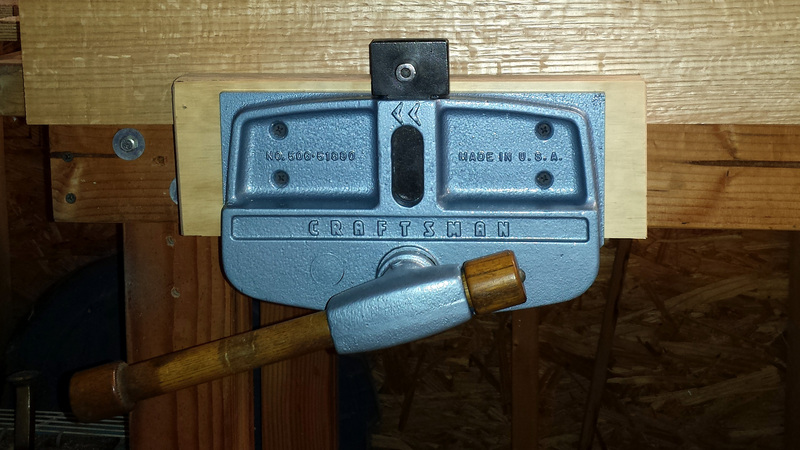 506-51890, which is the one I’ll discuss here, sold for $21.95 in 1960 (2016 price with inflation: $176.58 – still a very competitive price for a USA-made vise; not that one could be had new for that price or quality level today). 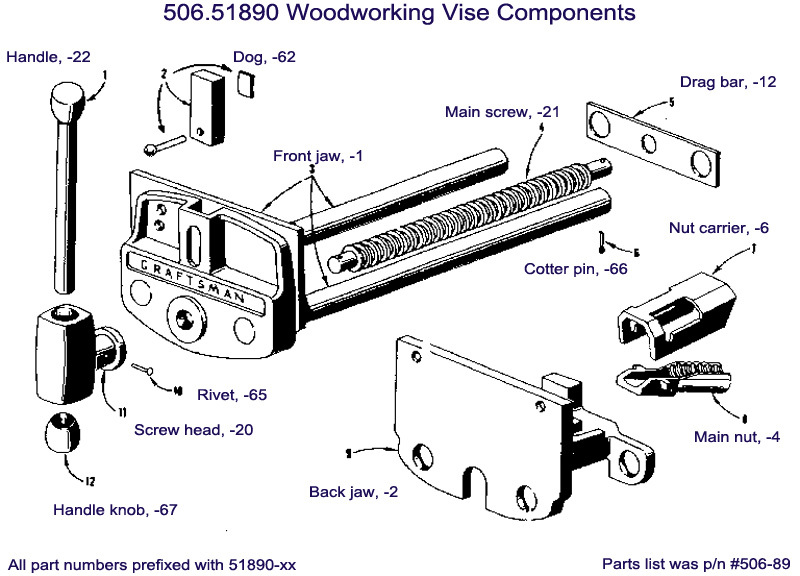 The vise is relatively simple in terms of construction. The jaws are cast iron, and heavy (the whole assembly is about 37 lbs. You have a back jaw, which is bolted under a workbench. The front (dynamic) jaw rides on two solid steel rods that engage holes through the back jaw. The main screw passes under the back jaw, where it runs through a cast bronze main nut and nut carrier. The nut and carrier are responsible for the quick release function of the vise: one half turn counter clockwise disengages the screw and nut, allowing the front jaw to be slid freely back and forth; a half turn clockwise re-engages it, and it tightens normally. The end of the screw goes through the drag bar and is captured by a cotter pin. The front jaw houses a steel dog and a standard handle. You can place plywood (or hardwood) jaw liners on the front and rear faces. There was apparently some variation within the model over the years in terms of the main nut and nut carrier construction (several versions exist that I’m aware of). Incidentally, if you’re considering purchasing one of these vises for shop use, be sure to inspect the main nut to be sure the threads are not broken off or worn out. These may – possibly – be replaced: User The Copilot on Garage Journal found a suitable, similar replacement nut for his Columbian no. 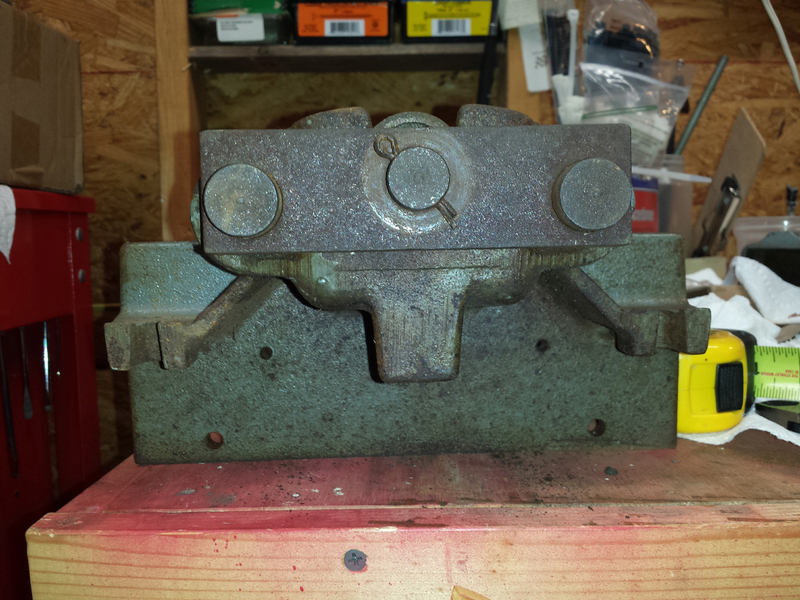 9-R (10″ wide jaws) vise by going to Milwaukee Tool Co and buying a bronze nut for their fast acting vises. Cost was about $20/ea plus freight. The nut was about 1/8″ shorter, but it worked for him. I believe Copilot’s vise uses a different style nut than mine, so you’ll have to do legwork to make sure this will work for you. 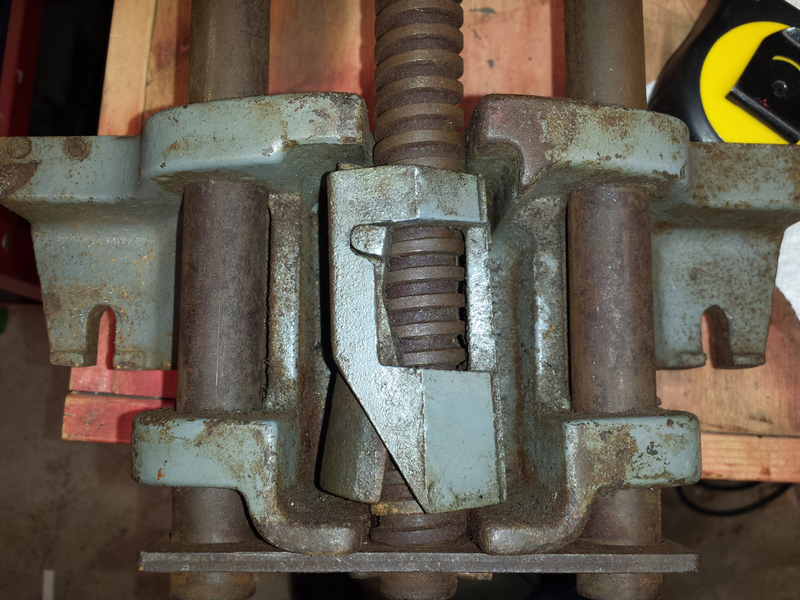 Still, this may be an option if your vise needs a replacement nut, without which, it will not function correctly. A little rough around the edges, but everything’s here except for the dog (replaced with a beefier homemade version) and the handle (which I removed before taking this photo). The jaws are 4″x10″ and open 10-12″, depending on the thickness of the jaw pads, once installed. Underside of the rear jaws, showing the quick release nut assembly. 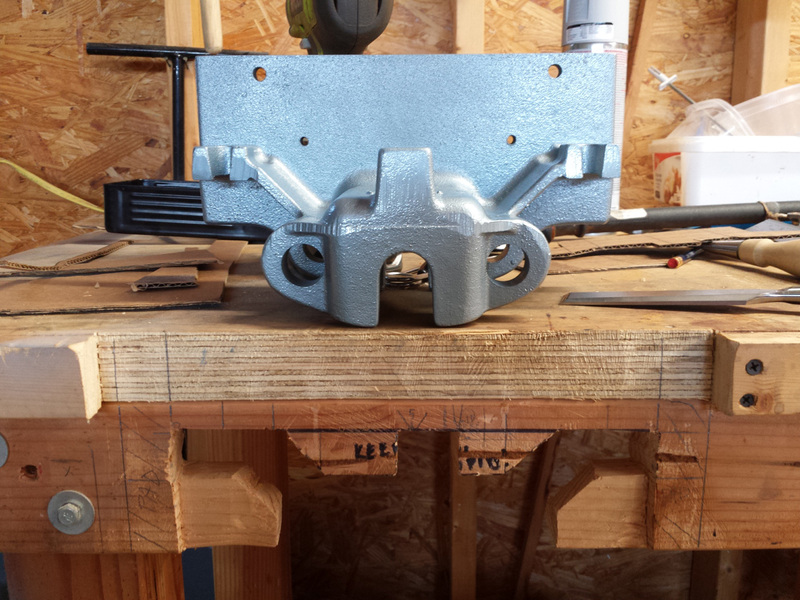 Rear view of the vise (it’s upside-down on the bench). The drag bar is visible. Removing the cotter pin was surprisingly difficult, and I ended up cutting it and driving it out with a punch. Here’s a better look at the nut carrier (top row) and main nut (bottom row). The original dog was missing, but the previous owner replaced it with a very nice (heavy!) shop-made dog with a larger head. I prefer it to what I’ve seen of the original. It is held against the front jaws using a small leaf spring behind the dog. I wire-wheeled the dog and then treated it with Perma-blue and paste wax to give it some protection from rust. 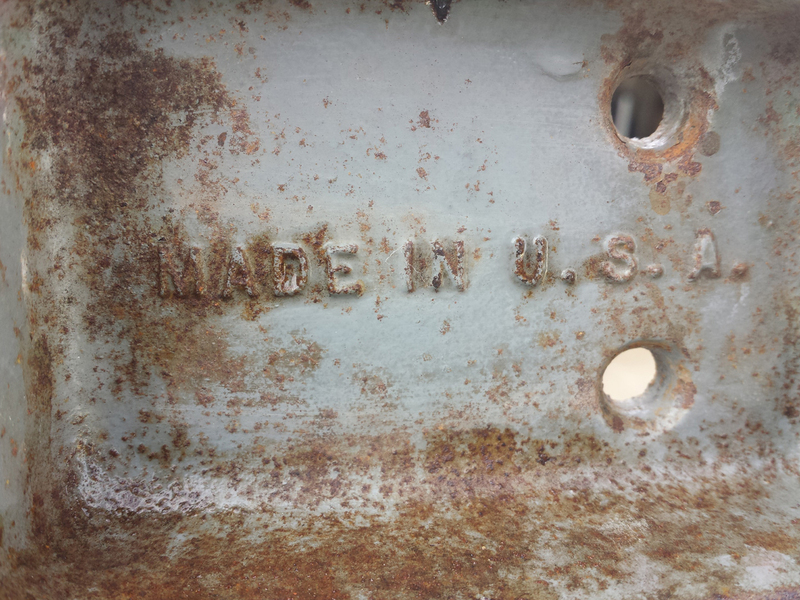 Made in the good ol’ USA. Upper side of the rear jaw. 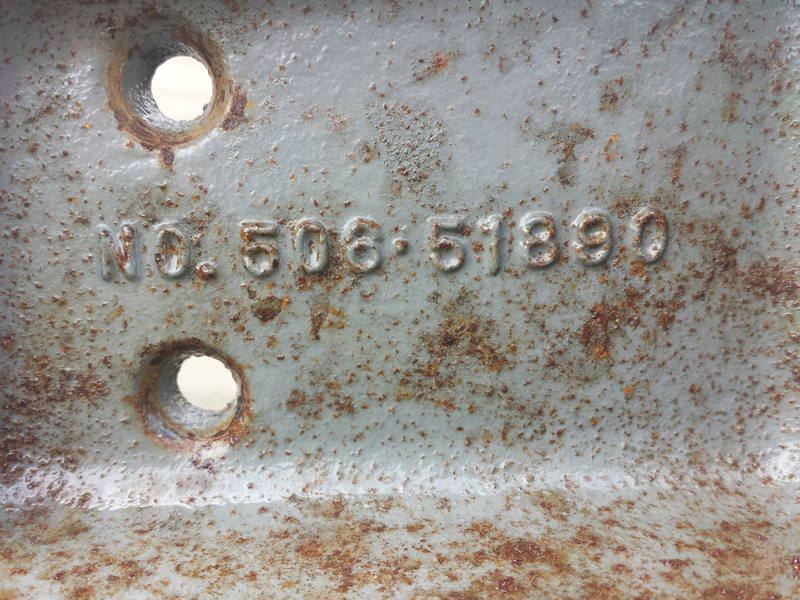 There is a Columbian model number casting mark by the lower part (see next photo). 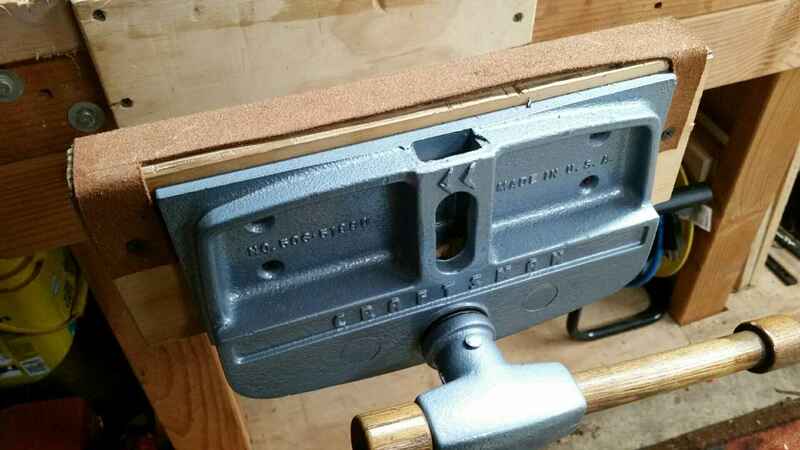 The casting mark 10R-2A is the same one Columbian used on their model 10R woodworking vise, confirming this Craftman was made by Columbian. 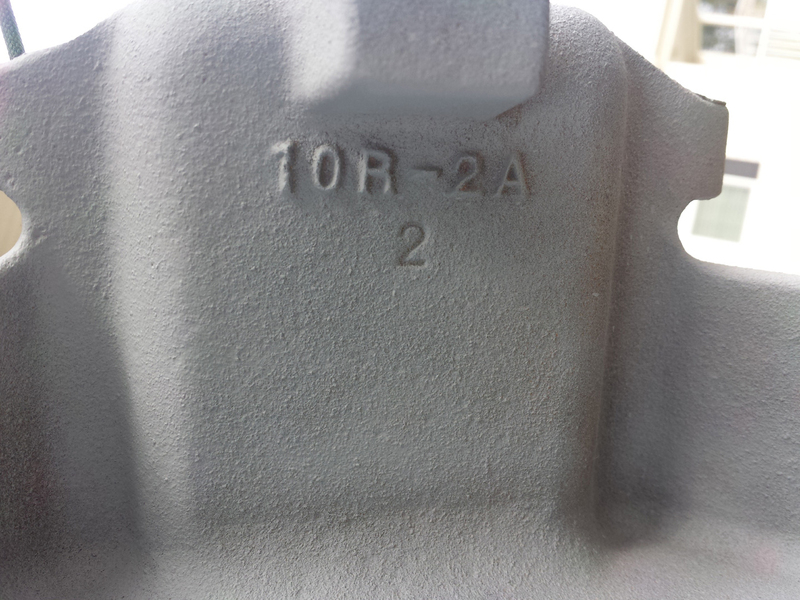 For comparison, look at these ebay images of a Columbian 10R-2A vise. I tried using a gel paint stripper, but it made a horrible mess and I will never use one again. Nasty stuff. I ended up wire-wheeling the whole thing. I later sanded the rods by hand until they were polished. Front jaw, rods, and lead screw. I didn’t disassemble these parts because the rivet on the handle assembly would have been a bear to replace. Masking them (after wire-wheeling them clean) was perfectly fine. Detail of the front jaws, now primed. No need to show you the entire priming process. 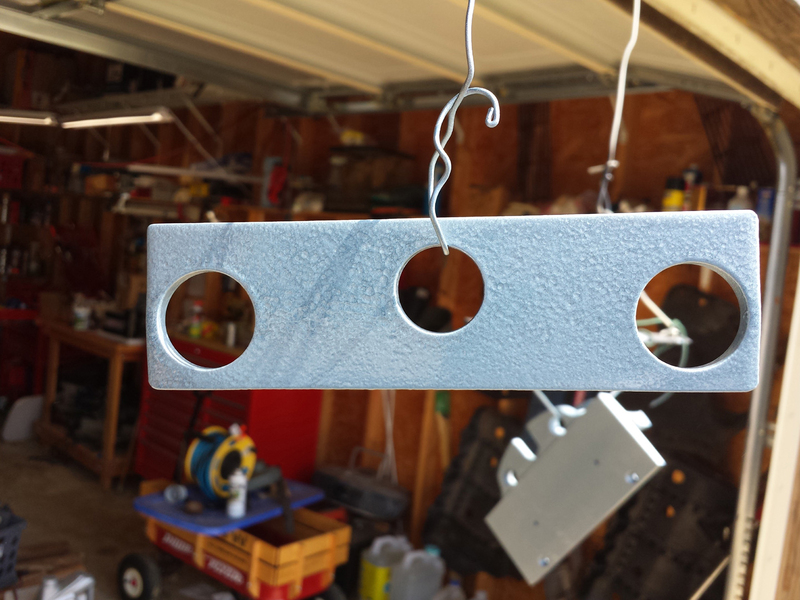 I let the primer sit for a week or two (mainly because I was busy), thenI painted the jaws and drag bar with Rust-oleum Hammered Light Blue from a spray can. Verde Green would have been pretty too, but it is semi-discontinued and was much too spendy for me. I was very happy with the light blue, however. I think it gives it a nice, vintage mid-20th century appearance. I hit it with two light coats followed by two heavy coats about 5 minutes apart. The blue is very subtle – my camera kept making it look gray. I got a pretty decent hammered look to the paint on the front jaws. 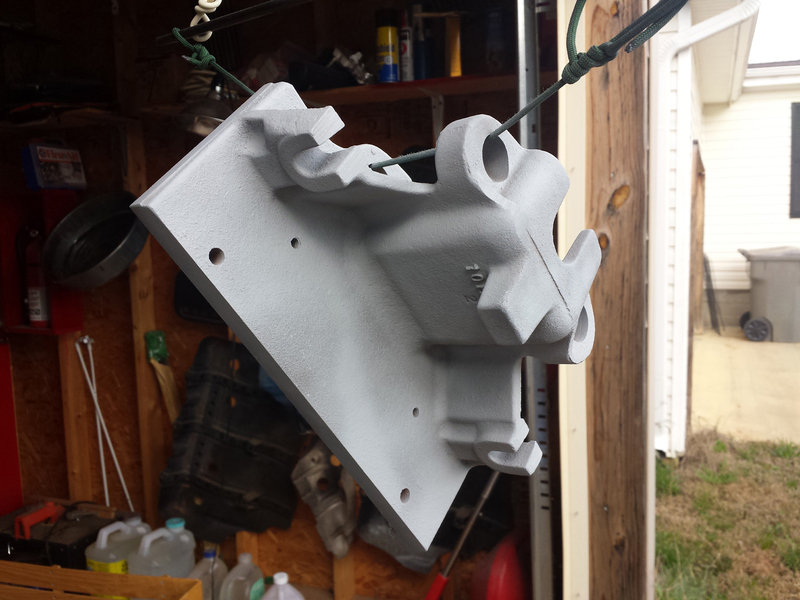 The rear jaw assembly didn’t look quite as hammered – I think it was because I painted the front stock in the cooler garage (so I could lean it off the bench) and the rear stock was hanging in the sun while I sprayed. Drag bar, painted with Rust-oleum Hammered Light Blue. 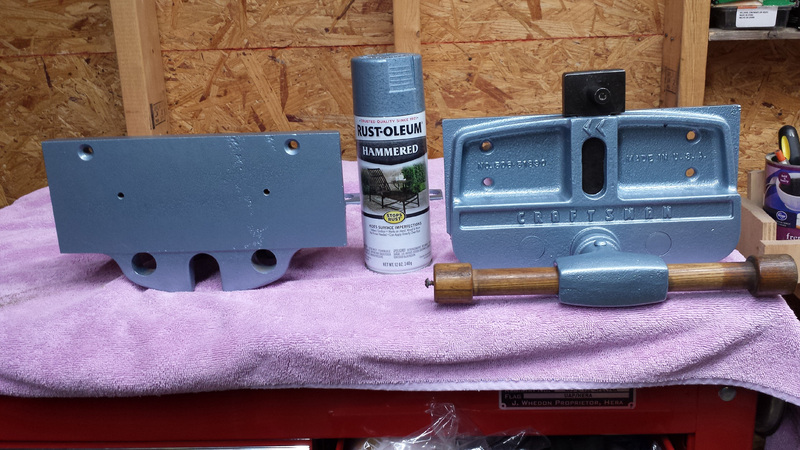 Front and rear jaws, painted with Rust-oleum hammered light blue. Dog was cold blued with repeated coats until dark. Mounting the vise was a bit of a pain, mainly because I was over-thinking trying to get a perfect clearance hole for the vise to slide into. I finally chopped the whole thing into a rectangle. Having a patient helper to hold the vise while you’re adjusting it and bolting it in is essential. Craftsman 506-51890 mounted in my workbench. One final thing you can do is to cut a piece of leather and attach it to the front jaw pad. 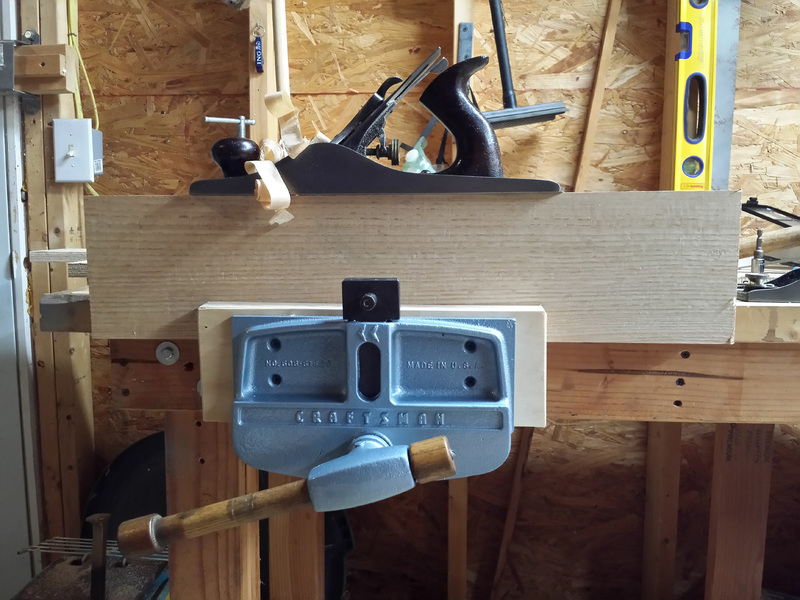 Paul Sellers recommends this for increasing the grip in this style of vise. If you’re clever you can make it so that it can be flipped in and out as you desire. I tacked the leather ‘ears’ on, then firmly seated the leather where I wanted it and clamped down the jaws. Then I soaked the top of the leather in rubbing alcohol and clamped a board across the top of the vise to hold the leather flat. A day or two later, I removed the board and the leather was formed to the vise as nicely as I could ask. I bought a nice 12″ x 24″ leather side piece (medium weight, split, vegetable tanned leather) to make a flap for the front jaws. 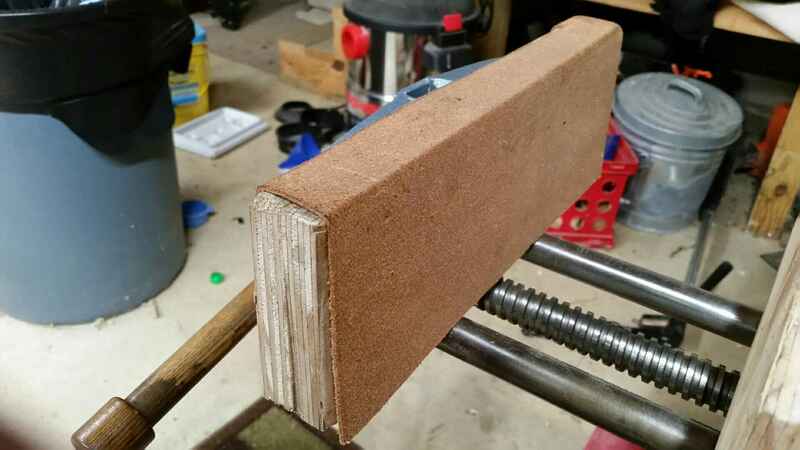 I pressed the leather down tight over the vise jaw and clamped it in place, then soaked the top in alcohol and clamped a board down over it to form the leather as the alcohol evaporated. It is now quite well formed. Hi from south-west France—I moved here from England in 2011 and I have arrived here from a link in an episode of Paul Sellers showing how he fits his vices to the bench. Now I’ve got that off my chest the real purpose of this note is to compliment you on a truly brilliant job of woodworking vice restoration. I have to do this myself in the coming months and I just hope that I can do as good a job with the restoration as you, and as good a job with the fitting as the both of you. How very kind of you to say! Good luck with your upcoming project! Glad I found this! 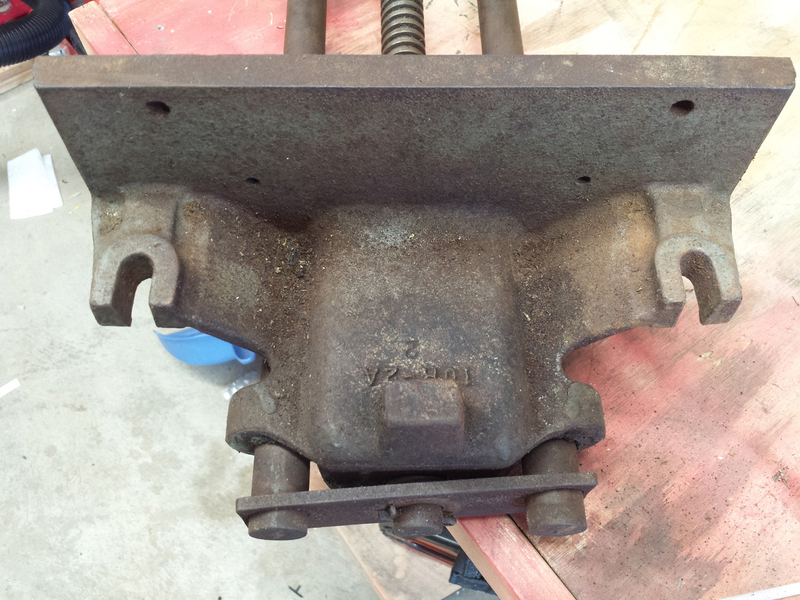 I just bought this exact vise on eBay, and at least $50 less than Columbian-branded ones. Needs a little cleaning up, but is in good working order, excited to learn its from the 60s! Mine is missing one cap to the wooden handle. Any suggestions? Mine was just held on with a screw, so I could see how it would get lost. I doubt you’ll find an old one to replace yours, but you could turn (or have turned) a replacement cap pretty easily. Some guys just replace it with pipe and pipe caps, but I think wood is better because it limits the torque you can apply. Hopefully a wooden handle would break before the iron of the vise cracked. Good luck and thanks for visiting and commenting! Comments really encourage me to keep this site going. 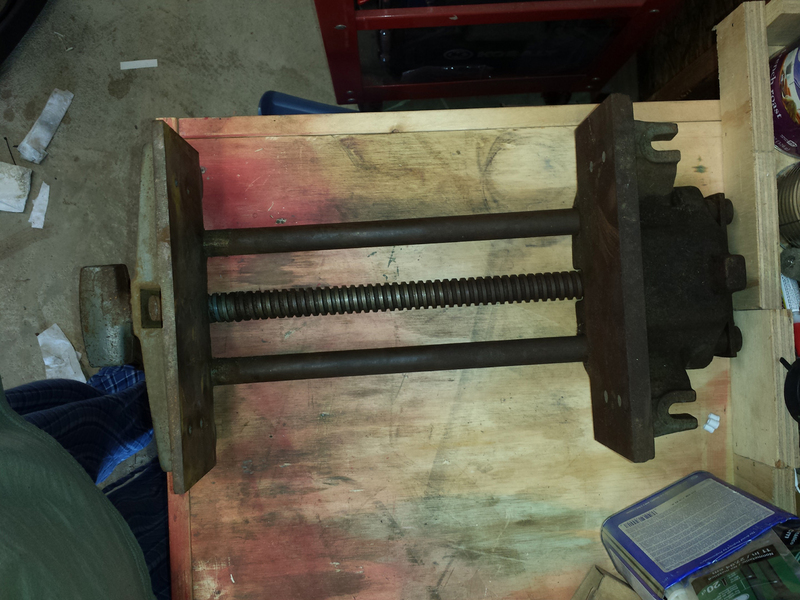 I have this vise but it’s missing the main nut and carrier. Any idea where I could find a relacement? It’s probably going to be difficult to find a suitable replacement nut, as these are pretty old. I refer to a guy in the entry who found a similar one at Milwaukee Tool Co. One may, or may not, work on ours, but it may be worth making some measurements and calling them up. Another option would be to find a donor ‘parts’ vise. Wish I could suggest better options. If you find a replacement part, please come back and post here so others will have the info too! Good luck! Thanks for the reply. I’ll let you know what I come up with. 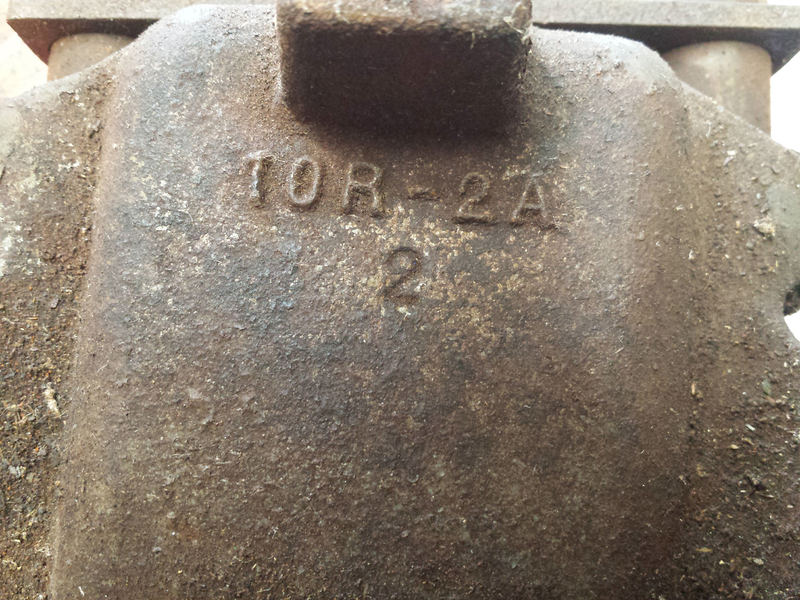 I did find a ‘parter’ that is probably in better condition than mine (which, I suppose would make mine the parter). $100 and 100 miles away, though. I’ll do some more research. Great job on yours, by the way!! Lots of good information here. Awesome job. I am putting mine back together as a final check after sandblasting it and It can open on the nut and carrier but wont close. It’s not worn out and I made sure it was closing and opening when I picked it up…. any ideas why its acting up now? There aren’t that many ways to put it together haha. If you have a picture of that by any chance? Or if I am simply using it wrong???? I have it sitting on a table it is not mounted… idk if that could have anything to do with it? Hm…the nut carrier assembly must be free to rotate a half turn. If it’s on a banchtop, I would confirm it’s not hitting the bench somehow. Second, when I first restored mine, it would sometimes not engage right away, which I think was due to the nut assembly and main screw being so clean and relatively frictionless that the nut assembly wasn’t getting tugged around enough to flip. You could try a little grease there for some sticktivity, or wait for a little shop dust to get on the threads and tighten things up. It’s probably related to wear. But you’re right – not much to screw up there, short of wallering out the bronze threads altogether. Let me know how it worked out! Merry Christmas! 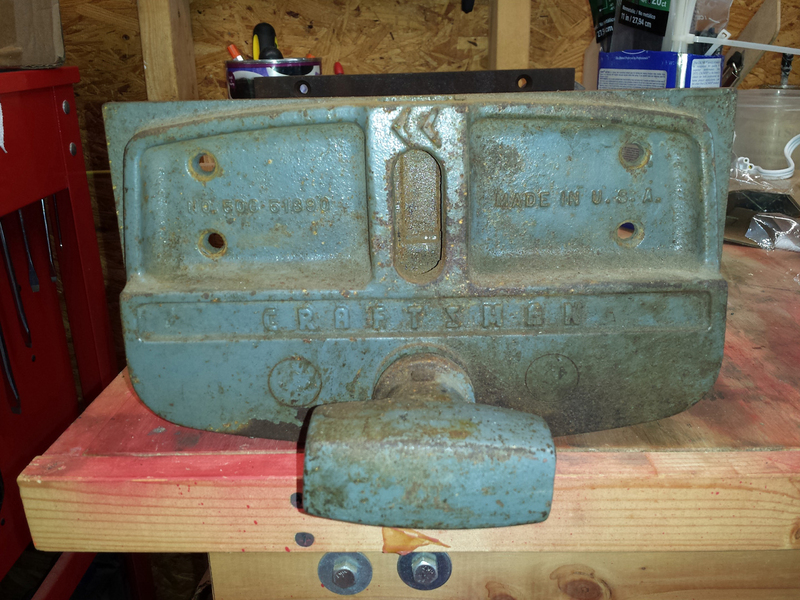 I just picked up this very same vise from an ad on a Facebook group. The guy wanted $35, I offered $30 and he said “sure!” He said it was his grandpa’s. 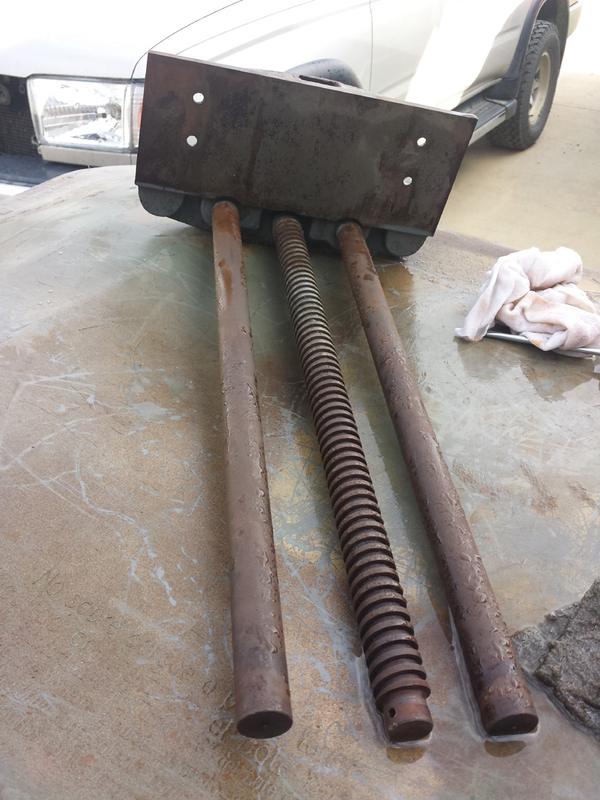 The screw and slide bars are rusty but it’s just surface rust. Even with the rust everything works. All parts are present and original. In thinking about this, I’m not sure if heirs would remove a vise from a bench to sell it. I kinda think this thing has never been mounted. In any event, I’m VERY happy I was the first one to respond to this ad. It’s a great vise! Thank you for your write up of your resto and for all the pics. Much appreciated! Wow! $30 is a steal. 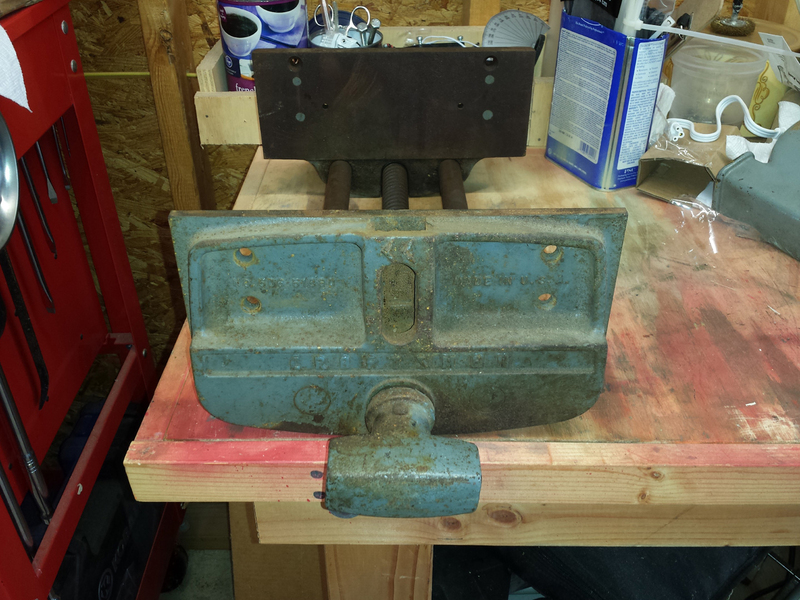 You can get it cleaned up and have a $150+ vise for your bench. I do think heirs may be willing to unbolt a vise for sale, but you may certainlu have a nice, lightly-used vise. Congratulations and happy new year! I am doing research on restoring it, which is how I found your blog. 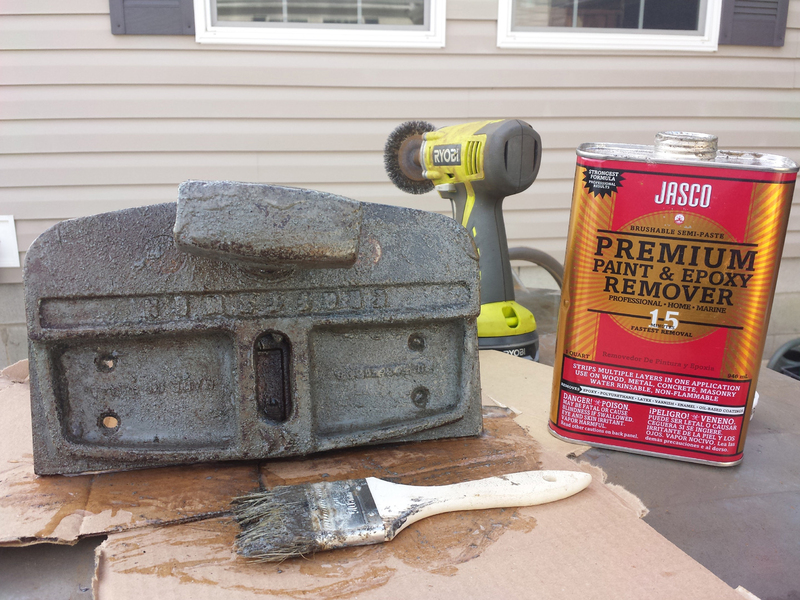 I think you’ve done a grand job restoring your vice, and I will be very excited to restore mine, using your blog as a resource. I like the fact that you tried to remain true to the original color of your vice. I don’t remember what color mine is, but I don’t think it’s blue. I’ll paint it the same as/near original. Right now, I’d say it’s mostly rust/dust colored. Thanks, Geoff. Good luck on your restoration! Thanks for visiting! I finally received my vice, and am beginning restoration. I am trying to figure out how to remove the dog, and the dog peg/handle isn’t budging. From your diagram, I can’t determine if it is supposed to unscrew, or otherwise locks into place? P.S. Is there another way to contact you if I have questions?